* Lease a 2018 Civic Hatchback Touring for $288 per month for 39 months. $2,595 down payment. 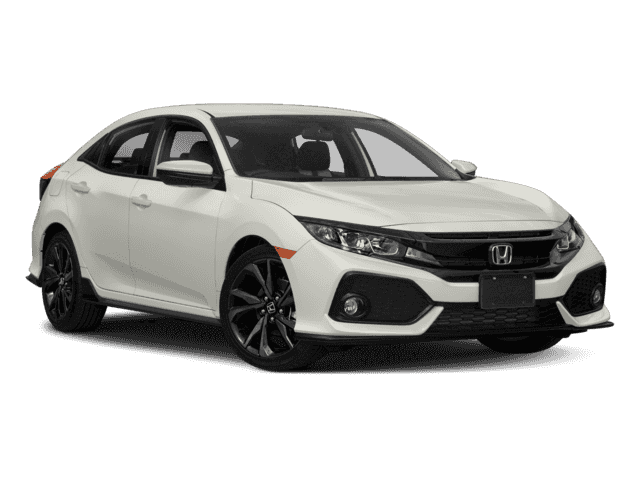 Millennium Honda in Hempstead is offering the stylish 2018 Honda Civic Hatchback. The Civic Hatchback is versatile and loads of fun to drive. It is offered in a variety of model trims to best suit you; LX, Sport, EX, EX-L, Touring, and Type R.
The 2018 Civic Hatchback LX is loaded with standard features including a 1.5 liter turbocharged and direct injected 4-cylinder engine developing 174 horsepower and 167 lb-ft of torque, drive-by-wire throttle, Eco Assist, electric parking brake with automatic hold, hill start assist, 4-wheel disc brakes, Available Honda Sensing (described below), projector beam halogen headlights with auto on/off, power side mirrors, security system with remote entry, automatic climate control, power windows with front auto up/down, cruise control, 60/40 split fold-down rear seat, Bluetooth, 160-watt audio system with four speakers, USB interface, speed-sensitive volume control, power door locks with auto-lock feature, and more. The Civic Sport Hatchback adds to or upgrades the LX features with a 1.5 liter turbocharged 4-cylinder developing 180 horsepower and 177 lb-ft (162 lb-ft with CVT) of torque. The continuously variable transmission (CVT) is available and includes dual-mode paddle shifters. Other features include 18-inch alloy wheels, underbody spoiler, center-mounted dual exhaust, fog lights, sport pedals, leather-wrapped steering wheel and shift knob, and rear seat center armrest. The Civic EX Hatchback adds to or upgrades the LX features with a standard CVT, remote engine start, 17-inch alloy wheels, fog lights, a driver information interface, rear seat center armrest, dual-zone climate control, smart entry with pushbutton start, one-touch power moonroof, Honda LaneWatch, heated side mirrors, 7-inch display audio with a high resolution touch screen, 180-watt stereo system with eight speakers, HondaLink, Apple CarPlay and Android Auto, Pandora compatibility, text message functionality, SiriusXM satellite radio, variable intermittent wipers, and available Honda Sensing. The EX-L Navigation Hatchback adds to or upgrades the EX features with a power driver’s seat with 8-way adjustment, heated front seats, leather-trimmed interior, leather-wrapped steering wheel and shift knob, automatic dimming rearview mirror, Honda satellite-linked navigation and traffic, and available Honda Sensing. The Civic Sport Touring Hatchback adds to or upgrades the EX-L features with the 180 horsepower turbocharged 4-cylinder engine, CVT with paddle shifters, LED headlights with auto on/off, auto high beam headlights, rain-sensing windshield wipers, 18-inch alloy wheels, underbody spoiler, rear centered dual exhausts, sport pedals, leather-wrapped steering wheel and shift knob, power front passenger seat, heated outboard rear seats, 540-watt premium audio with 12 speakers, and standard Honda Sensing. The Type R Hatchback adds to or upgrades the Sport features with a 2.0 liter 4-cylinder engine developing 306 horsepower and 295 lb-ft of torque, 6-speed manual transmission with rev matching, helical limited slip differential, lightweight single-mass flywheel, 3-mode drive system, water-cooled oil cooler, adaptive damper, track tuned suspension, Brembo front disc brakes, special Honda and Type R badges, aluminum hood, LED headlights and fog lights, special high-bolstered seats with double red stitching, Honda satellite navigation with traffic, and a lot more. Honda Sensing is available or standard as noted above and includes a suite of active and passive safety features including collision mitigation braking, adaptive cruise control with low speed following, forward collision warning, lane departure warning, lane keeping assist, and road departure mitigation. The sporty and exciting 2018 Civic Hatchback is available for you at Millennium Honda in Hempstead Nassau County. Stop by today and check it out!